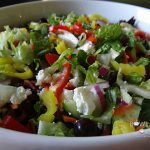 Greek Salad - easy, light and fresh Greek Salad can be a meal in itself or a great side for a terrific meal! Place all of the ingredients in a large bowl. Toss with salad dressing and dinner is ready, enjoy!